We enjoyed a BYU Gymnastics meet last year, so we thought it might be time to check out the Utes. We were surprised at the difference! 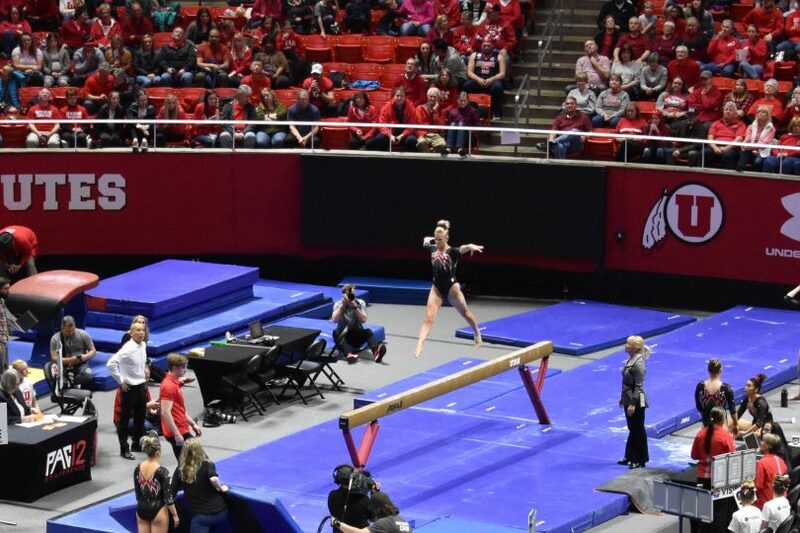 The U’s gymnastic meets happen in the large Huntsman Center, and we learned that they are the number one attended college women’s sports team in the nation. They draw more fans than any basketball team! The night we attended there was a sell-out crowd of more than 15,000! The atmosphere was electric and the fans were really appreciative of the high level of performance. 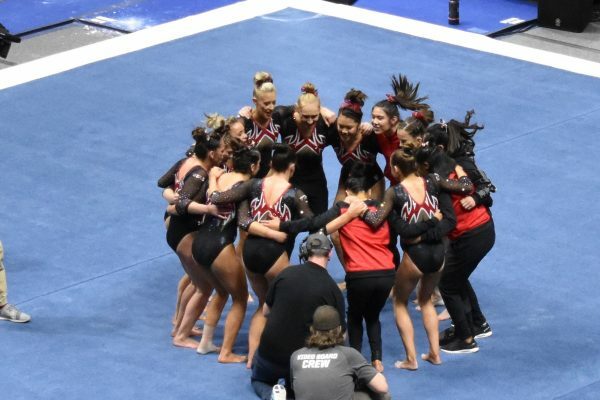 The Utes are always ranked, and they compete for the National Championship nearly every year. There were a lot of people supporting the gymnastics team. They also had lots of fun activities with the mascot and cheerleaders going on throughout the meet. We were really impressed with the quality of the gymnastics. 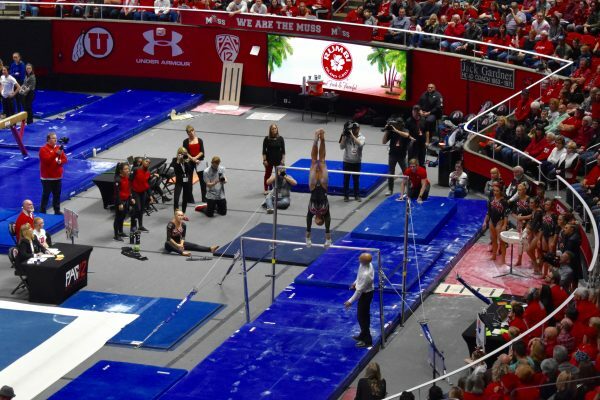 The Utes started on the vault, and their stunts were far more difficult than those of the visiting team. 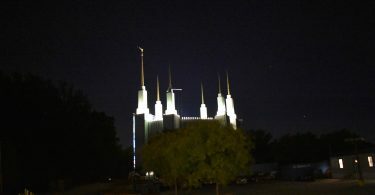 Nevertheless, they stuck every landing. The match was never even close. Next they moved to the uneven bars. 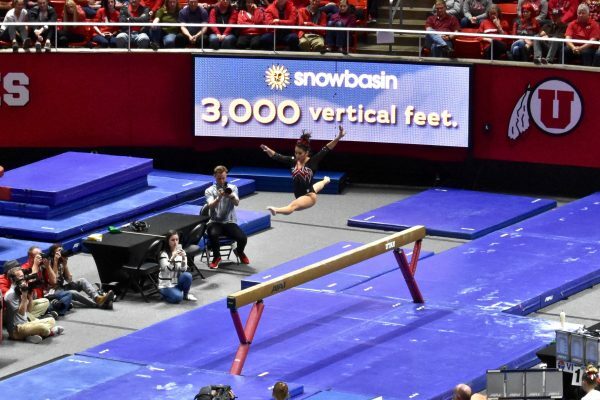 The height of their flips, the intricacy of their dismounts, and the speed of their routines left the others in the dust. 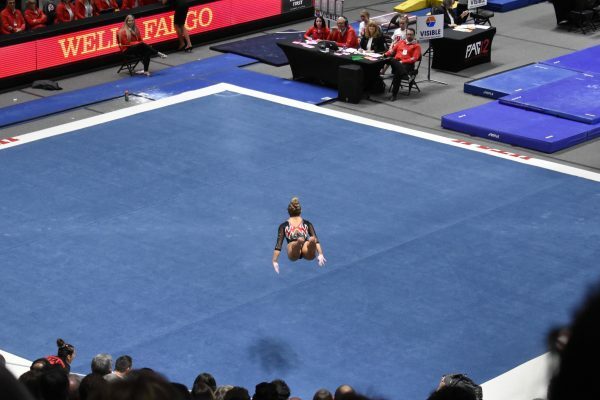 The vault is so quick, but these girls stuck their landings. The bars were one of the best events. The only mistake we saw was on the beam. One competitor fell off, but there were very few wobbles, and the team looked great. Their floor routines were amazing. They jumped so high! 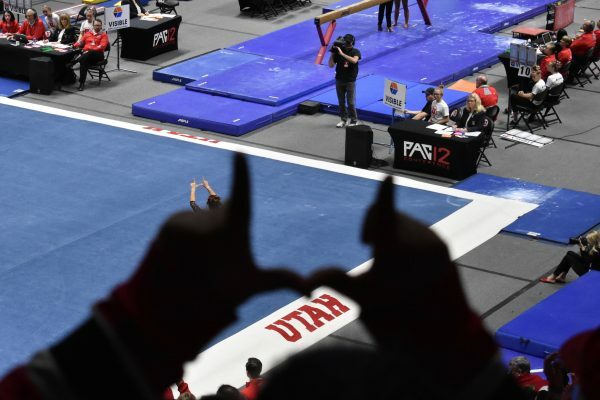 They even make sure to flash the symbol for the U in all of their floor routines. 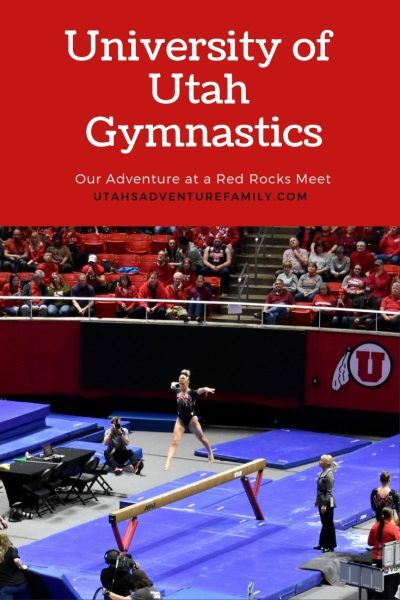 We love that Red Rocks’ team spirit (Red Rocks is their gymnastic team nickname)! Mom is scared to watch the beam because it seems like the most dangerous event. 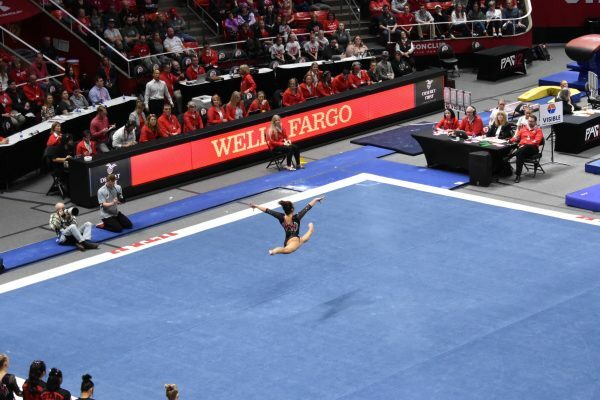 These gymnasts can jump so high! We love this picture because it looks like she is flying. The floor routines were so fun and impressive. 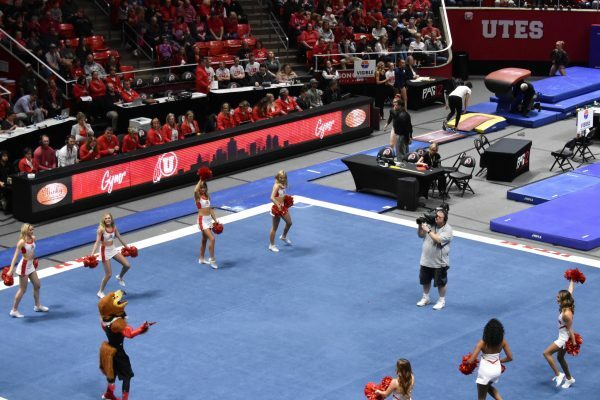 One thing we appreciated about University of Utah Gymnastics is that they used the jumbotron to tell what makes a good routine. We learned what moves are required and what the judges are looking for. This helped us understand a sport that we’re not too familiar with. 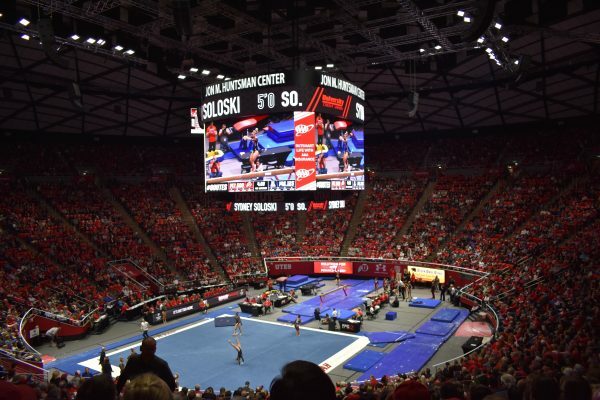 The gymnasts also appeared on the screen asking the crowd to participate with them in part of their floor routine. We watched all the closer, trying to see if we could help them out by clapping or dancing along. We had a great time at the Red Rocks meet. 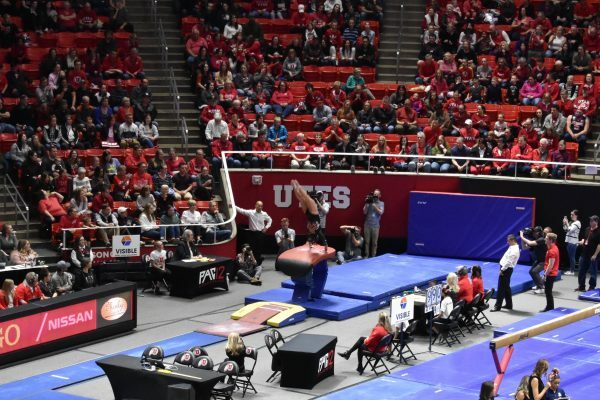 It was a really great night and we enjoyed our time at the University of Utah Gymnastics Meet. 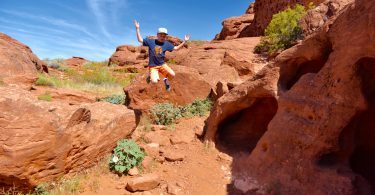 It wasn’t hard to see why the Red Rocks are considered a world-class program! Tickets can be purchased online. Watch for deals through your city recreation center or their website. They often have cheap tickets available for families. University of Utah has a clear bag policy. This mean only clear bags, and small purses are admitted. No outside food or drink. So plan accordingly. More details here. One factory-sealed bottle of water per person (1 liter or less), is permitted in the stadium and arena. Empty, clear, plastic water bottles will be permitted. Bottle-filling stations can be found throughout the concourses at the Huntsman Center. Think about parking before you go. There is no obvious lot to park in, so we got a map from their website about best places to park for free.